disp/story.mpl/editorial/ outlook/7324488.html) shows there is no reason to doubt it. Not only is he audaciously reckless in calling for public funding of property and buildings for all corporate charter schools in Texas, even as KIPP sits atop a pile of several hundred million dollars from the philanthrocapitalists, but he also demands that all of Texas' "parental choice" charters, the ones with black and brown and poor kids anyway, be converted to the psychologically — sterilizing, apartheid KIPPs or KIPP knock-offs such as the YES College Preps. Duncan for "failure" (a gang war in the projects outside had lowered test scores for one year, giving Duncan the pretext to shut down the school as the first attempt at "Renaissance") and was to be reopened as a "Multiplex" — four schools inside one building (with four separate principals). Within a year, KIPP had left Williams, to locate at another school until it was again told to leave. 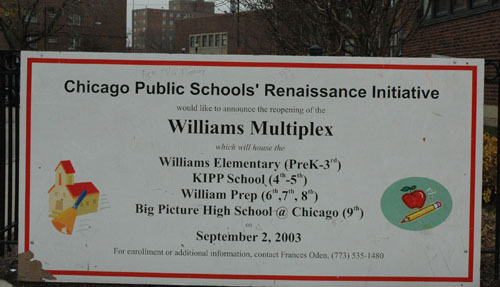 The Chicago KIPP school is currently at Penn Elementary School on the West Side. Despite millions of dollars beyond what Penn ever received, CPS has been unable to make the Penn community take the KIPP schools, which is as controversial as ever. Substance photo by George N. Schmidt.The other segregated charters, the lily-white-flight ones with family incomes to match their soaring test scores, will be left untouched, except of course, their building will be paid for by the state and their principals CEOs will be given unconditional authority (like the rest of the charters in Feinberg's fantasy) to hire, fire, and promote without the burden of any consultation with teachers. And what happens to the parents and children who discover that their choice-without-a-voice school based on an abusive behavioral catechism of total compliance is not what they signed up for when the KIPP recruiters brought their canned pitch into their living rooms? Well, in that case they don't have a choice except to return to the malignantly-neglected public schools they were trying to escape in the first place. In Feinberg's dreamworld, charters can't do it all--there will always be the need for the marginally-funded public schools that mimic the lockdown methods of KIPP to accept the discards that could, otherwise, damage the KIPP brand with low scores or a disruptive and stubborn refusal to become miniature corporate automatons. And if these children can't cut it there in the residual public schools? Well, there is the other penal system, the one that provides free room and board, an orange jumpsuit, and good jobs for the smiling, postivized guards that Feinberg's human-crushing crucible will crank out. The fact that our society, even in Texas, could be contemplating Feinberg and Levin's eugenics-inspired brand of containment, segregation, and behavioral sterilization, provides evidence that we have learned nothing from the previous century's dangerous flirtations with fascism. Our present Gilded Age is as blind now as that one a century ago, with "progressives" like Feinberg and conservatives like Rick Perry both embracing the same "educational" strategies and tactics in an emerging version of a "war against the weak" that has the same goals as the one that swept through America a hundred years ago, the one that inspired a middle-brow madman in another country suffering the bludgeoning effects of economic meltdown and war. [Editor's Note: If the links above are not live in your browser, please just copy and past them into the Browser. We're sorry, but the SubstanceNews link function is sometimes quirky]. To learn more about Gates, Broad, and philanthrocapitalism, have your library order this book. We cannot bury our heads in the sand when it comes to the state of public education in Texas. Our lean economic times have made many policymakers' decisions difficult, but there are also many new reasons to celebrate innovation in public schools. We have a golden opportunity, and a responsibility, to effect lasting change for Houston's students. With almost 20 years' experience as an educator in Houston's low-income communities, I have seen firsthand how transformative a great education can be for a child. I began my teaching career as a Teach For America corps member in 1992, and currently serve as superintendent of KIPP Houston, a network of 18 public charter schools serving over 6,000 students. Over the years, I have witnessed great teachers, in supportive and challenging school environments, turn struggling students into eager scholars, with newfound dreams of college. Charter schools are not the "magic bullet" for education, but high-performing Houston charters like YES College Prep, Ser Niños, Harmony Public Schools and KIPP are proving what is possible in public education. The problem is that the demand for these quality charter schools is outpacing the supply. This year, after we filled the seats in KIPP Houston schools through an open lottery, we still had 3,400 students on the wait list. That's a heartbreaking number. Provide high quality charter schools with facilities assistance. Right now, KIPP and YES Prep educate a combined 10,000 students. By 2020, we're hoping to grow that number to 30,000. But to reach this goal, we need buildings where our students can learn. And unfortunately, charters, unlike traditional public schools, don't start off with a school facility in which to work — they have to find and secure their own, without government help. The government needs to level the playing field, and seed expansion of high-performing charter schools, by giving districts incentives to open up unused spaces for charters to use. For example, districts might receive the kind of increased freedoms their public charter counterparts now enjoy, in exchange for giving local charter schools access to much-needed facilities. The government should also back bond offerings for public charter schools, as it does for their traditional counterparts, so that the competition for buildings is fair. Close down low-performing charter schools. The charter school movement was based on a simple premise: freedom to innovate, in exchange for accountability around results. Unfortunately, not all charter schools are living up to this promise. Even more upsetting, loopholes in the current charter law are allowing low-performing and fiscally irresponsible schools to stay open, which casts a pall on the majority of charter schools in Houston and across Texas that are keeping their promises to their students and families. At KIPP, we believe in a "no excuses" approach to education. We should hold all charter schools to that same standard of "no excuses." The legal loopholes must be closed, and underperforming charter schools must be held accountable for their results. If charter schools are excelling, they deserve support. But if charters can't measure up, they should be closed down. Expand an extended school day and year to more schools. As proud as I am of KIPP's growth, I am even more excited about seeing elements of KIPP being adopted by district schools. HISD has taken some promising steps in this direction, including its Apollo 20 initiative, which is working with 20 historically underperforming Houston schools to pilot innovations adapted from successful charters, including the extended day and year. But just lengthening the school day with the same old approach isn't enough. Those Apollo principals, and all their colleagues, need the power to lead, to hire and to manage effective teachers. And then they need the freedom to innovate. Students need creative, high-expectations instruction in core subjects, while being exposed to music, other arts, sports and community service. In challenging economic times, investing in public education is the smart thing to do. But we have to be responsible and thoughtful about how we allocate scarce public dollars. By supporting and expanding proven educational models, we can change the lives of thousands more underserved students in Houston, which in turn, helps make future economic times more rosy. Feinberg is superintendent of KIPP Houston.